During the holiday season, all I want to do is make cookies. All of the cookie recipes I’ve been eyeing throughout the year, this seems like the time to make them. I want chocolate cookies, I want mint crinkles, I want pecan shortbreads, I want soft sugar cookies decorated with frosting designs, I want ginger snaps. Maybe this is why I always add a layer this time of year? Maybe. I recently bought a bottle of rosewater (mostly because there’s this dish in Jerusalem (the cookbook)- swordfish with harissa and rose – that I had once and I’ve been wanting to make it again), and it had been sitting on my pantry shelf, looking pretty but also lonely. And then I came across this recipe for “Pistachio Rosewater Snowball Cookies” in the latest issue of Kinfolk Magazine. They sounded like a beautiful twist on what some people call Mexican wedding cookies or Russian Tea Cakes or any other number of cookies: nutty with pistachio, and aromatic and floral from the cardamom and rose. After making the recipe from Kinfolk, I made a few small changes to the recipe, and I wanted to share them with you. I thought the original was a little heavy on the rosewater, and a little light on the cardamom (though my roommates and Jonah really enjoyed them as they were). They’re buttery and crumbly. They’re sweet but with a unique flavor with them. And they smell beautiful. Note: I found rosewater with the cocktail mixers at my local grocery store. It might also be in with the extracts in the baking aisle. If not, you can find it online. Second note: Before you invest in making this recipe, you should definitely read through this recipe, and know that 1) pistachios are pricey, especially if you buy them already shelled and 2) there is a lot of kind of annoying pistachio prep. You’ve been warned. Preheat your oven to 350 degrees. Line two baking sheets with parchment, or butter them. Bring a medium pot of water to a boil, and blanch the pistachios for 1 minute. Drain them, and place them on a clean dish towel. Fold the dish towel over the pistachios and rub off the skins. (There may be some stubborn ones that you need to peel off.) Spread them in a small baking dish and roast them in the oven until they’re just dry, about 8 minutes. Set them aside and allow them to cool. When they are cool, pulse in a food processor or blender until they’re finely ground, but definitely not a paste. Transfer them to a small mixing bowl and whisk together with the flour, cardamom, and salt. In the bowl of an electric mixer, beat together 1 cup of the powdered sugar and the butter until pale and fluffy. Add the rosewater, and mix it in. With the mixer on low, add in the pistachio flour mixture and mix just until a dough forms, scarping down the sides of the bowl as needed. Roll the dough into 1-1.5 inch balls. Arrange at least 1 inch apart on the pan, and bake until they’re just golden on the bottom, ~20 minutes (mine took a little less). While the cookies are baking, pour the remaining cup of powdered sugar into a wide bowl. Remove the cookies from the oven, allow them to cool from a minute or two, and when they’re cool enough to handle, roll them in the powdered sugar. Allow to cool the rest of the way on a wire race. I hated Brussels sprouts as a kid, as most kids do. I remember my mom making them on occasion, usually steamed with butter melted on them. She was the only one who ate them. Now that I am a so-called “adult,” I have only become slightly more receptive to these small green balls of vegetable. However, this recipe from Plenty by Yotam Ottolenghi has me almost craving them. The best part about it is the way they are fried: with lots of oil and salt, face down on hight heat for a couple of minutes. One side gets black and crispy, one side is still green. 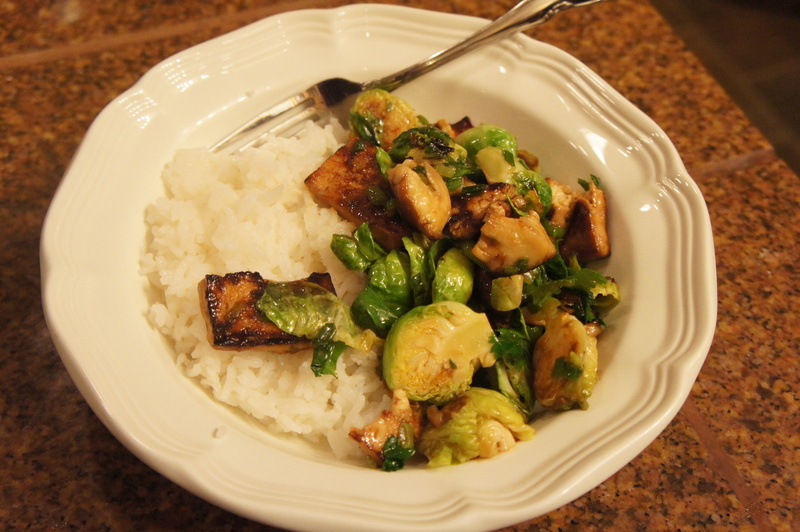 Also, with the addition of tofu, this recipe makes a meal in one bowl! Find a medium bowl and in it, whisk together the sweet chile and soy sauces, 2 Tbs of the sesame oil, the vinegar and maple syrup. Cut the tofu into 3/8-inch-thick slices and then each slice into two squarish pieces. Stir the tofu into the marinade and set aside. 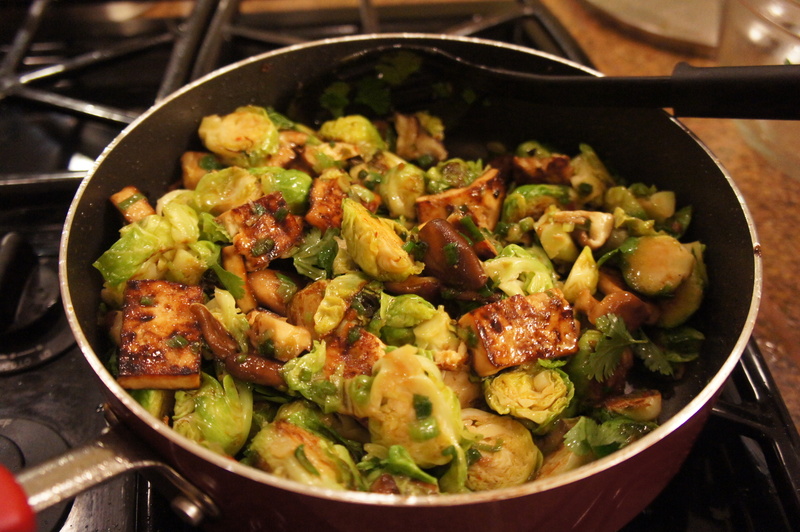 Trim the bottoms off the Brussels sprouts and cut each into three slices from the top down. Find a large frying pan, add 4 Tbs of canola oil, and heat up well. Throw in half the Brussels spouts, or less than depending on the size of your pan (when I did this the oil spit like crazy, so watch out!). You want most the sprouts in the pan to have at least one side touching the pan, so no sprouts are stacked on top of one another. Sprinkle some salt on them and cook on high heat for about 2 minutes. Don’t stir to much, but shake it around if necessary. You want the sprouts to be almost burnt on one side. 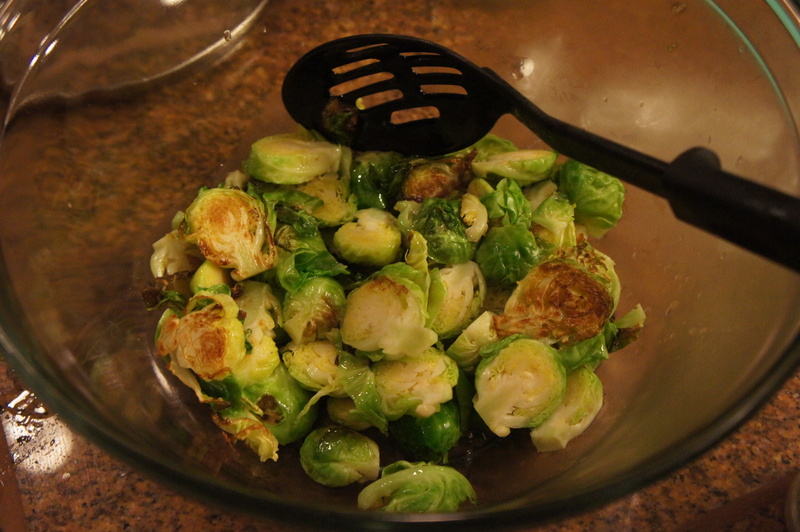 Remove to a bowl and add the rest of the sprouts to the pan with more canola oil. Add more salt, and 2 minutes later, transfer the rest to the bowl as well. Add 2 more Tbs of canola oil to the pan and sauté the green onions, minced chili, and mushrooms for 1-2 minutes. Transfer to the bowl that the sprouts are in. Leave the pan on high heat and use tongs to lift half of the tofu pieces from the marinade to the pan (again, oil spits!) (don’t throw away marinade!). Space them apart and leave in one layer so that they can fry properly. Reduce to medium heat and cook for 2 minutes on each side. Transfer to the sprouts bowl and repeat with the rest of the tofu. Remove the pan from the heat and return all the cooked ingredients from the spouts bowl back to the pan. Add the leftover tofu marinade and half of the cilantro leaves. Toss everything together, and let the pan cool down a bit. Then taste and add salt if needed. Stir in the remaining Tbs of sesame oil and serve warm, garnished with sesame seeds and/or the rest of the cilantro. Eat with rice or by itself.